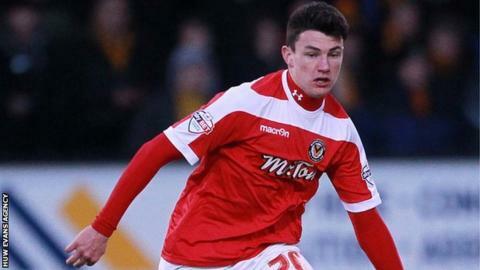 Newport County defender Regan Poole will complete his move to Fulham before the January transfer window closes. But Poole, 16, will stay on loan at the League Two promotion chasers for the rest of the 2014-15 campaign. Manager Justin Edinburgh said: "For Fulham I think it makes sense because they are going to have a player who will probably be into double figures on League appearances at the age of 16." Edinburgh is also close to sealing the loan signing of a League One striker. He said talks were at an "advanced" stage and the deal could be made ahead of Saturday's game against Shrewsbury. County have been negotiating Poole's move to Fulham for some weeks and Edinburgh feels the loan arrangement "is only going to enhance his progression". Edinburgh added: "They are more than happy. They have seen the progression he has made in the short time they have been tracking him. "He is going to learn far more playing for us, a team chasing promotion, than playing development team football. Fulham see that as well." Meanwhile, versatile midfielder Robbie Wilmott made his return from a foot injury in a development team match on Tuesday. Wilmott has been sidelined since October when there were fears he would miss the rest of the season. He might now be considered for a squad place against Shrewsbury.